Available in Spanish as Preparadas...Listas...!Ya! While watching the swimmers on a Girls Inc. team practice for a meet, I noticed how many girls liked swimming and racing, even when they were yelling at the coach, or even when he was yelling at them (but in a caring, coachy way). It seemed clear that a coach’s, teacher’s, or parent’s dreams for a girl helped keep up her energy and hope. That was the feeling I wanted to put in this book. Readers may brainstorm a list of adjectives that describe Jessenia, then come up with specific actions to show evidence of how they know her characteristics. Jessenia’s team doesn’t win the race, and she’s not a famous person, but to me she is a hero. Kids may discuss the qualities that make someone admirable and write a story or poem about one of their own everyday heroes. They may write about a race or contest they lost, but where they learned or “won” something. 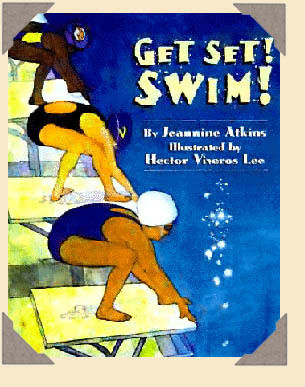 Or they might write about something they love to do, the way Jessenia loves to swim. What are their dreams? Do their mothers, fathers, or some older person have a dream for them? Hector Viveros Lee modeled some of the paintings after people and places he knew from the school where he was then teaching on the Lower East Side of New York. Someone may point out the way dreams and memories appear in the illustrations: how we see palms and the sea fade in over the gray city. The illustrations here are a type we call realistic. To look at another style, find I Had a Hippopotamus in which Hector Viveros Lee uses brilliant colors and dark outlines for a fantastic array of animals. To purchase this book, please visit Amazon.com.